Designed for use in the examination of whole blood in hematology applications, EDTA tubes feature interior walls that are coated with either K2EDTA or K3EDTA. The EDTA tubes equipped with a gel separator contain a barrier gel in the base of the tube. During centrifugation, this gel forms a stable barrier between the serum and the blood cells, separating the serum from fibrin and cells. VACUETTE® tubes are manufactured from virtually unbreakable PET plastic. These clear tubes are supplied with non-ridged pull caps that feature an exterior color-coded ring to indicate either the additive used or draw volume. A black ring indicates standard tubes, a yellow ring indicates the inclusion of a separation gel, and a white ring indicates a tube designed to accommodate pediatric draw. Tubes are spray-dried with 1.2–2.0mg EDTA/1 mL of blood. 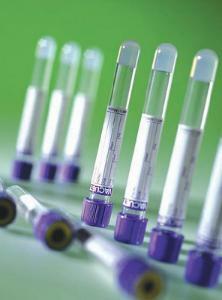 Tubes can also be used in the closed mode with direct sampling analyzers.